I came across this the other day and pondered why it’s a common error. When we drill into the details, we can see why confusion could arise. We are all used to lots of things that are – ‘per hour’ e.g. Speed in miles per hour, water flow-rate in Litres per hour, wages in Pounds (££) per hour. 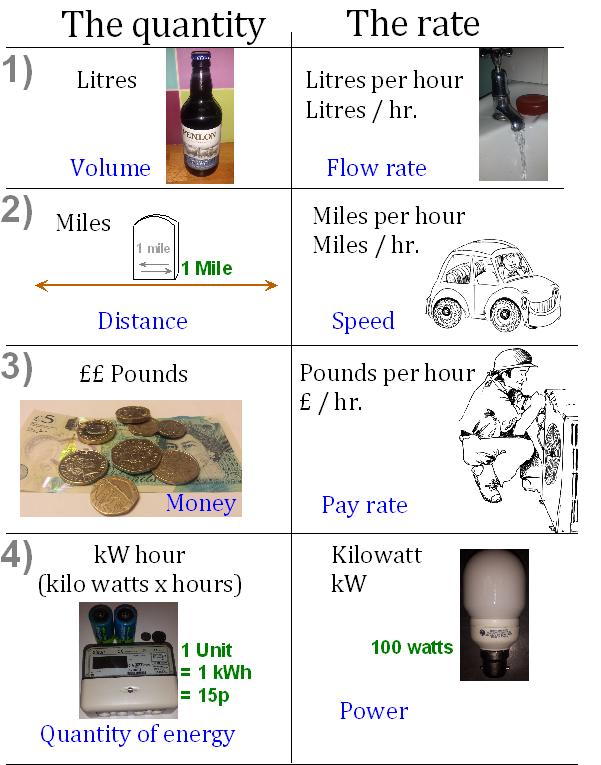 The unit of energy – kwh, is the odd one out. There is no ‘per’ involved. We will come back to that in a minute. If you think about it historically; miles, litres and money came well before any thought of needing the ‘per hour’ rate of these things. E.g. We measured Miles well before we thought of needing a unit for speed…. Miles per hour. Apart from in science circles (who got it right of course), I would think that the units of power and energy evolved historically the other way around. The first unit required was power – the horsepower, the watt, or the kilowatt. When we first started generating electrical power, it was horse-power or Kwatts that was the all-important unit. E.g Watts as a measure of the intensity of a light bulb etc. The next consideration would have been measuring the total quantity of power over time. If we generate 1kW of power, then after 1 hr, we have a quantity of energy of 1 kW multiplied by 1 hour. In a whole day, we would have 24 kWhrs (kW x Hrs), or 24 units of electricity. Now a utility bill can be sent!! The image below illustrates various examples of quantities of something on the left, with the corresponding rate to the right. The first 3 above are easy to understand, but the last one is a little strange. Given the common unit for power was the kWatt (on the right), then to find a unit of quantity we need to multiply power by time, not divide by time as for other units. One important point to mention, that some people miss, is the ‘/’. This means ‘divided by’ or ‘per’. However if we want a ‘multiply by’ in our units, what do we put?? We put NOTHING! How confusing is that! e.g. Miles per hour or miles divided by hours = miles / hr. Kilowatts multiplied by time = kW hr. Maybe it’s no wonder that there is confusion. So here is how to never get it wrong again. kWatt is the amount of Power. kWatt hr. is a quantity of energy. Posted on 19th February 2018 19th February 2018 2 Comments on Kilowatts per hour! A guide for the perplexed. To my mind, the whole point of having a heat pump is to save energy, so it somewhat jars with me when I see one aspect of a system that is not in-line with that aim. A heat pump always stores Domestic Hot Water (DHW) in a cylinder. The Cylinder is, we hope, sized and optimised for heat pump use so that the COP (and lowest running cost) is the best-we-can-get. This detail should be taken care of by the manufacturers and designers. The detail of distributing the water to the taps is however often done using rule-of-thumb and the installer’s past experience. Energy-efficiency is often low down on the priority list, so may be given little thought. Hot water must of course be available at a sufficiently high flow-rate, this may lead to choosing a large-bore supply pipe. However, this large bore pipe holds a lot of water, so when a tap is turned on, there can be a long wait before the tap runs hot. After the tap is turned off, the heat from this volume of hot water left in the pipe is slowly lost. This is not good for energy-efficiency and low running costs. This may in-part usefully heat the house, but often it is simply a waste. It is certainly a waste of water. I recently came across a pipe run that took such a long torturous long route that I filled a whole sink before the tap stared to run warm! As short as possible – the most direct route. Normally, a single ‘main artery’ is taken from the cylinder, and run to taps in turn. This distribution pipe will normally start big and, as each ‘tee’ off to a tap, it will at some point reduce in diameter. Furthermore, if several taps are on at the same time, then one flow may affect the other. E.g. the pipe needs to be big enough in diameter to maintain a good steady flow-rate for a shower. The choice of pipe size is often a dilemma, so playing-safe and choosing larger pipes would at least safeguard against an inadequate pipe run. This would however tend to go against saving energy. Running separate pipes from the cylinder. The pipe run to the bath is usually large diameter. This is where the fastest flow may be needed so that the bath fills quickly. However, a bath is not used very frequently, so the losses as described above may not be as great here as envisaged. Kitchen sinks however tend to be used many times over the day, so total losses of heat and water could be high. The worst scenario could be a kitchen sink at the end of a large long pipe run via a bath. A solution to this could be to run dedicated pipes directly to sinks. Position the cylinder as close to the taps that are most frequently used (e.g. the kitchen sink). Ideally find a central location to all taps. Decide the best configuration, e.g. some sinks can share, others may benefit from their own dedicated supply pipe. Identify the most suitable diameter of pipe. Insulate frequently-used pipes, BUT this may give limited advantage since it may simply take longer to lose all the heat in the pipe. Hotels and large houses often adoped a pumped circulation loop so that the taps run hot almost immediately. This saves water and is convenient to use, however, the hot loop can waste a lot of energy, even if well-insulated. I would try to avoid a pumped loop if possible. It may be better to have point-of-use direct electric heaters, than to have a pumped loop that is always wasting heat. There is a bit of a myth that suggests that plastic pipe is ‘smoother’ than copper. The most important factor is the actual bore size. The wall material makes little difference. However, plastic can very easily be bent with sweeps, these are better than straight pipes with tight bends. In this sense, plastic can be ‘smoother’. Anyhow, the difference between copper and plastic is quite dramatic due to its internal bore. It is very important to allow for the internal pipe sizes, and it is possible to use a combination of the two, e.g. run plastic through the middle of joists if it’s possible, but use long straight runs of copper along a wall. There are figures here to give a rough idea of what sizes might work. It is surprising how much more restrictive 15mm plastic is compared to 15mm copper. This info goes along with a disclaimer since it can be hard to know all the factors involved in a system. I am a great believer in getting a sample of pipe in a coil and doing a test on site with a bucket. I have successfully run a kitchen sink via a 10mm plastic pipe. The bore is only 6.7mm which is about the diameter of a pencil. I had no noise problem at all. In general, more noise would come from part-open valve or tap than would come from a smooth pipe. Remember to clip the pipe well to stop any annoying clonking that can occur with any pipe when a tap is shut-off quickly. I have heard that statement enough times to make me want to write a blog about it. It seems intuitive to think that any bottle neck in a pipe system is the limiting factor for the flow–rate. At first thought, it seems like the weakest link in the system. I then started to wonder why this topic is so well understood by electricians and so misunderstood by some plumbers. I also recall chatting to a Heating College lecturer who said “They have made these training courses so you don’t need to think anymore”. If that is the case no wonder the topic can be perplexing. However, it is far from rocket science. For water to flow through a pipe system, a pressure difference is required. [between (A) and (C)]. This pressure is usually provided by a circulation pump that literally pushes the water through. The flow-rate depends on two things, 1) the pressure difference between (A) and (C), and 2) the total restriction of the pipe. Electrical circuits are almost the same. v = i multiplied by r or volt difference = amps x resistance[ohms]. Plumbers have no such luxury. We would need tapping ports at various points around a circuit if we want to know pressure differences. We only know the static pressure at one point, which tells us nothing. Furthermore, we generally have no idea how much is flowing in each individual pipe run. There is also no easy way of measuring the resistance of a pipe system, so there is no easy resistance equivalent for pipes and fittings. All-in-all, the heating engineer is very much in the dark, and would have little idea what the pressure is at point (B). Here we have a PV panel at a long distance from a house. It will make perfect sense to any electrician to have a very thick long cable from (A) to (B), whilst having relatively thin cables at each end. The important requirement here is that the total volt-drop due to total cable resistance is kept low. For every metre of cable, there is a very small volt drop, and all these add together. The calculations can easily show the volt-drop. You can use a cable calculator on-line. It is the LENGTH here that is the issue. If (A) and (B) are close, that section could be thin, but if the cable is long, it need to be fat. If the cable is very long, it needs to be very fat. However, making the short ends any fatter will make very little difference to the total volt drop. Back to our water pipes, the same thing applies. Every metre of pipe causes a pressure drop (when water is flowing), and every metre adds up. Again, it is the LENGTH that is a major issue here. For example, if you have say a 5m length of pipe and you need 1m head of water (0.1 bar) to make a certain flow rate, then you need twice the pressure if you have twice the length. 50M of pipe would need 10m head (1 bar) to give you the same flow rate. However, it you swap that 50m pipe for one of bigger diameter, you will have far less resistance in the pipe. The required flow rate can be achieved with far less pressure. It is easy to overlook the pipe LENGTH, this has just as much affect on the flow and pressure drop as the diameter does. This is why a water meter with a very small bore does not affect the flow-rate very much – it is very short. Put 10 water meters in-line, one after another, and you have a big restriction, and a big problem. So, back to our earlier assertion that any small-bore section of pipe bottleneck is akin to the weakest link; The bottle-neck principle does not apply here in the same was as it would to traffic on a motorway. If cars acted like water molecules or like electrons, they would push bumper to bumper and shoot through a bottle-neck at extremely high speed! To finish, let’s do a little exercise on pipe sizing. Let’s look at a scenario with a 10m (30ft) high header tank is supplying a tap/valve via a large bore pipe. i.e. a good 1 bar pressure supply of water. Let’s consider extending this pipe and look at what flow-rate will emerge out the end of it. We are assuming 1 bar pressure at the start, and zero bar (atmospheric pressure) at the outlet. We can firstly consider a 15mm (outside diameter) pipe (the most common pipe size for taps). One 40m length of this plastic pipe would give us a flow rate of around 8litres/minute (About 2.1 US gallons/min or 1.75 UK gal/min.). This is a typical bath-tap flow rate. If we use copper instead, the wall-thickness is thinner and internal bore is bigger. We could have well over twice the length of pipe and get a similar flow rate coming out of the end. As you can see from the grid, you could go as far as 720m if a 22mm copper pipe were chosen. If we go in the other direction and fit a small pipe, we can see that a 10mm copper micro-bore pipe that was about 14m long would still give us 8lit/min. If we now look at 10mm plastic with its small internal bore of only 6.6mm (pencils are fatter than that) then it could be no longer than 3m if we want the same flow rate to fill a bath. 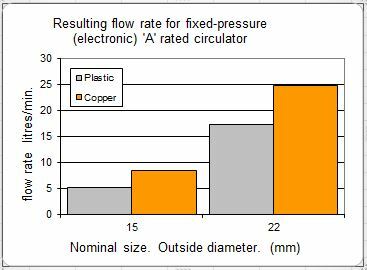 This simply illustrates how the diameter and length could be adjusted to give the required flow rate given a certain available pressure. In summary, a short thin pipe may act similarly to a long fat one. I am aware that the pressure requirements of heat meters is often overlooked – this can be detrimental to a heat pump system. A heat pump will normally be connected to a radiator or underfloor heat-emitter circuit. A circulation pump (circulator) is required to ‘force’ the water around this circuit. Each part of the pipework and each components acts as a restriction to flow. The greater the restriction, the bigger the circulation pump needed. Indeed, many systems have 2 or more circulators, whilst it should be possible to only have one. Heat meters (reading heat in Kw’s) are often required to calculate RHI payments. The main component of a heat meter is a device fitted in a pipe to measure the liquid flowrate through the system. This device will cause a restriction to flow. However, it would be ridiculous for our heat-measuring device to impair energy-efficiency by either causing an inadequate liquid flow-rate, or by increasing circulation pump energy demand. Most common circulation pumps can produce a maximum of 5 or 6 metres water head (0.5 to 0.6 bar), however, this is at the pump’s low flow-rate. For energy-efficient operation, we should operate them at mid-pressure range, ideally no more than a pressure of 2.5m head of water to work against. Some heat pumps have one circulator to circulate through the heat pump and the emitters. If the heat pump requires say 1m water head for its required flow-rate, and the emitter circuit requires a further 1m head, then the circulation pump needs to exert a total pressure of 2m head. There is little pressure left to overcome restrictions for a the heat meter, so the heat meter should not be too restrictive. Even if your system has 2 circulators, the head meter should not cause a significant restriction so you must SELECT THE CORRECT METER. At their rated flow-rate, some heat meters will require high pressure for circulation. Some cheaper options can require up to 2.5m head pressure. This is a lot. However, if a larger heat meter is chosen, its pressure drop can be very low since, for example, if you halve the flow-rate, you quarter the pressure requirements. Modern meters can retain high accuracy even at very low flow rates. E.g. if your system flow is 1 cubic m / hour, your best low-pressure option might be to fit a 2.5 cubic m/hr device. The example chart below show how the pressure drop can be very low if the meter is used at a flow-rate well below its maximum. Note also that some meters are inherently more ‘restrictive’ than others. The colours are my own opinion, and relate to adding a heat meter to a heat pump system. The Vortex Flow Sensors have exactly the same issue, and there are fewer pressure ranges to choose from. However, in the region of 25% of their rated capacity, the pressure drop is usually nice and low. The message here is – Don’t fit a meter without assessing the pressure drop at your expected flow rate. Don’t necessarily trust the meter supplier since they don’t all understand the energy loss implications related to heat pumps, and may want to sell you the cheapest option. It could be perfectly acceptable using a high/medium pressure drop heat meter on a biomass district heating system feeding radiators, but for heat pump applications, we could be running into trouble unless the pressure drop is low. Oddly, I see little mention of pressure drop on many heat meter data sheets. Posted on 8th June 2016 21st March 2017 Leave a comment on Selecting the right Heat Meter. Note; The below are just examples for this blog, and don’t necessarily show the whole story. 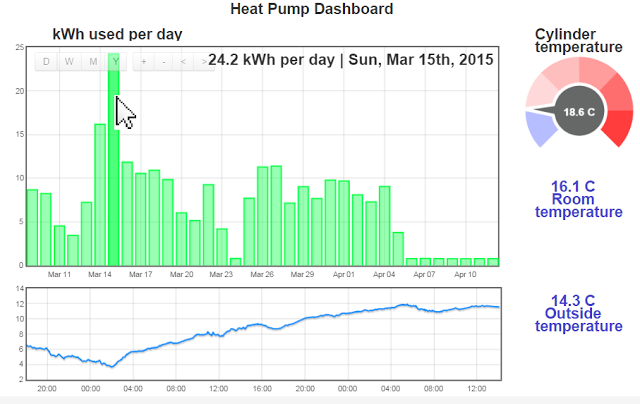 The dashboard above shows a bar graph of daily energy input to the heat pump. This can be checked periodically for unusual values. It is showing high use on 15th March. By mousing-over the graph we can see that on this day, 24.2 kWh were used. The reason for this high use could be investigated. The time period can easily be changed to anything you wish by zooming in or out. Below this is the outside temperature. This might be interesting on its own right, but may be interesting if compared to energy used per day. To the right are a few useful dials and figures – cylinder temperature, room and outside temperature – things any home owner might like to know. We can see that as from 6th April, the system is switched off. If you have a high temperature heat pump, it doesn’t mean you always have to operate it at a high temperature. If you operate it at lower temperatures, the performance should be far better. It is however always a good idea to find out the working limits of you unit. Some of you may have wondered about the flattening of the curve at very low temperatures. I have drawn it that way because some heat pumps are not very good at the extremities (limits) of their performance. However, I am finding (and partly guessing) that most inverter heat pumps with electronic expansion valves work very well over a very wide range, so some heat pumps will easily exceed COPs of 5 in ideal conditions (usually late spring or autumn, when not much heating is needed) .Never forget mid-winter conditions – this is the time we need most heat, so the operational area to focus on. I have been using OpenEnergyMonitor.org energy monitors with heat pumps for a few years now and thought I should briefly share my experience. This covers the practical side of temperature sensors, and is based on my experience. The sensors used in OpenEnergyMonitor.org modules are DS18b20. These are Maxim 1-wire digital sensors. They actually have 3 connections; 0v, 5v and signal. Since each sensor has its own unique i.d. code, multiple sensors are simply connected into the same 3 terminals on the monitor device. The great advantage of these digital sensors is that there are no errors due to cabling. Phone extension cable can be good enough. Thermistor sensors (variable resistance, as PT100) rely on a specific cable resistance and furthermore some sensors could ‘drift’ out of calibration. A further advantage of digital sensors is that they do not in themselves generate heat. They can therefore be used in still air with good accuracy. If several sensors are strapped together (with an elastic band) and tested in a thermos flask over a few hours, most seem to read within 0.2 degrees C of each other. If you have say 6 sensors, you can chose those that agree most for the most important sensing (e.g. flow and return). Anyhow, these sensors are perfectly accurate enough for this type of monitoring, and there is comfort in knowing that if you are seeing 35.2C (for example) on a graph, then that sensor tip must be at 35.2 +/-, with a small error margin of say 0.15 degrees. This is because the digital signal is generated inside the sensor. What to measure on a heat pump? Hot water cylinder temperature, and at least one room temperature. For either of the above there could be a buffer cylinder involved in the design, therefore the flow and return from buffer cylinder to emitter (e.g. underfloor or radiators) may need to be monitored. There may also be mixing valves (sometimes unnecessary mixing valves) on underfloor manifolds. These may also need monitoring. 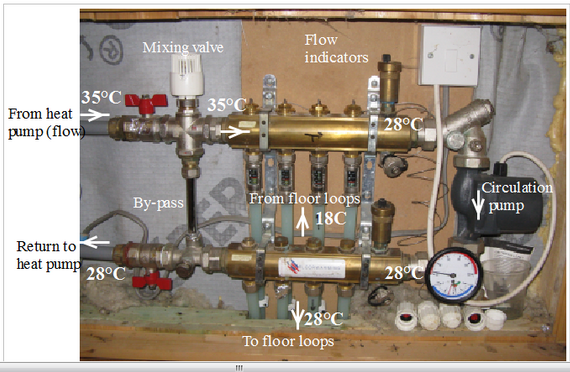 For more detailed analysis, the refrigerant internals of the heat pump can be monitored. These may include discharge, suction and liquid temperatures. This is however a little intrusive, and could affect the warranty. It may be necessary to discuss this with the system installers. Measuring internal air temperature is relatively straight forward, but sensors must be positioned away from any source of heat or radiation source. Sunlight and close-by appliances and even lighting can greatly affect readings. The general rule for outside air measurement is to keep the sensor well away from sunshine, or areas that get sunshine. The sensor can also drop below the air temperature if it can ‘see’ a clear sky. A small polystyrene roof is a good shield protection from positive or ‘negative’ radiation (i.e. when radiation from sensor is greater than its surroundings). It is also necessary to keep the sensor dry, unless you purposefully wish to cover it with a wet ‘sock’ to record Wet Bulb Temperature. There is a lot of information available about this relating to weather stations. Most heat pump monitoring involves the temperature measurement of water and liquids flowing in the pipes. The pocket usually involves a ‘tee’ fitting and a hollow pocket that is completely surrounded by the liquid. The sensor is inserted into the pocket. An easier and cheaper method is to fix the sensor to the outside of a metal pipe. This method is used in all heat pumps for their on-board sensing. Any sensor that is outside the liquid can be affected by the temperature of the surrounding air, but the error in the reading can be negligible if the sensor is mounted correctly. It is a good idea to fit several pockets like this in the right places during installation. Obviously the pipe must be empty. Whilst not as good as surrounding the sensor with a conductive copper pocket, it is possible to simply strap the sensor to a pipe. Strapping using a copper strap (as used in refrigeration) , or copper wire, will give better results. The following shows one simple method. Copper or brass conduct heat well. The temperature difference between the inside of the pipe and the outside is tiny, so always fit sensors onto metals. Plastic pipes are poor thermal conductors, so the effect of surrounding air can affect the sensor temperature. Furthermore, if the pipe is changing in temperature, the sensor may ‘lag’in time behind. i.e. it will respond very slowly to temperature changes. This may or may not be a problem. This is not the best position for a sensor since there is 3mm of plastic between the liquid inside and the probe, however, the copper wire strap is making the best of a bad job. Heat will conduct along the copper. There is a lot of copper in contact with the plastic, and this will conduct and will transfer heat to/from the ‘surrounded’ probe. If this is insulated well on the outside, it may give good-enough results for ground source comparisons. Time response may be a little slow, which may not necessarily bad. Fitting the probe onto a metal fitting is a far far better bet. Many years ago, when heat pumps were not so common, I found it a real struggle to get any of the main underfloor heating suppliers to embrace the need for low water temperatures for use with heat pumps. 15 years on, and I’m sure that things have changed dramatically, but I’m still stumbling across things that make me doubt that. When I visited Germany over 10 years ago, I got the feeling they commonly use much closer spacing between floor pipes than we do in the UK, and I have read of very close spacing (50mm) in Austria. I realise these are potentially cold countries, but even recently visiting a Spanish heat pump company, they were surprised that we don’t use closer pipe spacing (more pipes). Over the last 6 months I have heard several references in the trade to; ‘never use closer than 150mm pipe spacing’. However, CIBSE clearly give ratings for 100mm spacing, as does the MCS Emitter Guide, so why are some in the UK so resistant to putting more pipe into floors. Heat pumps are more energy-efficient if the water temperature is low. 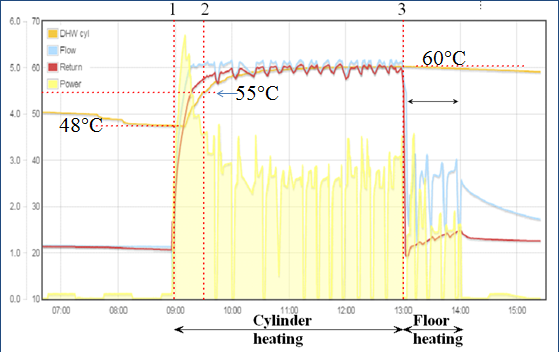 This graph of an air source heat pump shows how beneficial a low flow temperature is. Units like this with electronic expansion valves are particularly efficient at very low water temperatures. The values for the example graph above have been extracted from CIBSE, and show a general trend for a fixed heat output. It demonstrates what we all should know – the closer the spacing, the lower the required water temperature for the same heat output. Putting the two together we could plot pipe spacing v COP. It would clearly indicate that closer spacing improves COP, so why do some seem reticent to embrace close spacing? Is that added cost for more pipe really that much?? I have gleaned that some people have the notion that close spacing could lead to warm floors and an overly hot house. The whole point here is that with closer spacing, we can turn the water temperature setting (heating curve) down, and get the same heat output, thus improving the COP. I think some of the fears about hot floors stem from boiler systems, many of which had plenty of extra output capacity for quick warm-up, and hot patches could result. However, heat pumps are generally slower response, with lower water temperatures, so are much more forgiving in this respect. I recently visited a system where I had used 50mm spacing in an always-open loop in a bathroom. I asked the owner if they had ever thought the bathroom floor was too warm. The answer was no, never. The reason why I had used 50mm spacing was that we didn’t want a buffer cylinder, so I was trying to ensure there was adequate water quantity, and flow-rate in the floor – effectively using the floor as a buffer. Another hot (excuse the pun) topic here is floor coverings. People are now seeing that a carpet will drop the star rating for RHI, so there is an added financial incentive for having solid (tiled etc.) floor, as seems far more common in Germany, instead of carpet. However, by designing a house where some rooms are tiled, and some are carpet, you are somewhat limiting any changes that future occupants might wish. (e.g. 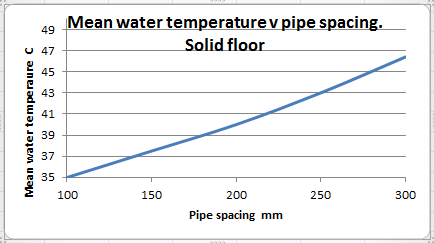 if 100mm spacing in a carpeted room, and 200mm in a tiled room). Underfloor pipes are literally set in stone, so can never be changed. The only solution that I could think of here would be to interlace the loops (given that there is often more than 1 loop per room). There is always the option of turning off one of the interlaced loops. I like multiple interlaced loops. I have come across an installation where a new owner had fitted thick pile carpet in one room without thinking the affect it would have. The result was a cold room, remedied only by turning up the water temperature, thus increasing the running cost, and the reliance on room thermostats to limit heat to the tiled rooms. The general design approach for underfloor is to consider the heat required (e.g. watts/sq m) , but unless a buffer cylinder is fitted, we should also consider what heat is being delivered to the floor, given that some zones will be closed for some of the time, and the outside temperature is seldom at design temperature (-2C etc.). For most of the time, we have far more available heat than the floor needs. Even with modulating heat pumps, there can still be a tendency for the flow temperature to stray above the theoretical flow/return temperatures. This is another reason for favouring more pipe in the floor. Furthermore, MCS requires the heat pump to provide at least 100% of the design at -2C etc. Due to models only being available in certain size jumps, the heat pump installed is often oversized, so this is an added reason for ensuring that there is adequate pipe in the floor. In this example of a system with a simple buffer tank, the heat pump flow/return needs to be approx. 4 degrees hotter than UH flow/return. This could reduce energy efficiency by 10%, plus the added energy to run a second circulation pump. A buffer can usually be avoided IF enough zones are always on AND if there is plenty of pipe in the screed. Another potential worry is the thermal mass of the screed. I was recently involved in the design of a passive house where a buffer cylinder was not wanted, so I proposed to use the screed as the buffer, and fitted 9 x 100m loops with average 100mm spacing in a floor that was 200mm thick. One might expect some temperature overshoot, and I may not have been so bold as to propose it if it were not for the fact that due to the interlaced nature of pipework, we could shut off ½ the zones if we needed to. The result was surprisingly good with all room zones open and control on one master thermostat. The whole house has very even temperatures. This demonstrates the self-regulating nature of very low temperature underfloor heating. Another concern I have heard of is the pumping power required for such a lot of pipe. In the above passive house example. If the heat pump needs 10 lit/min to give a 5 degree flow-return dt , then the flow rate is about 1.11 litres/min for each pipe loop. If we used a more standard 5 loops, the flow rate per loop would be 2 litres/ min. For the same heat (kW) and same dt, more pipe actually means less pumping power since the heat output per m of pipe is lower, and the flow-rate for each loop is lower. Finally, I have also come across the notion that mixer valves and pumps are desirable, even for a heat pump. Here is an example to illustrate the potential penalty of having a mixer even if the mixer never actually mixes (i.e. its fully open). The arrangement here with recorded temperatures shows that the flow to the floor is always equal in temperature to the return to the heat pump. 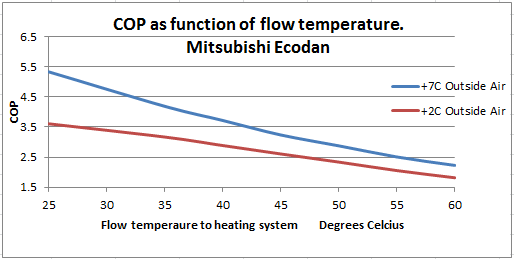 In this example, the flow from the heat pump is 7 degrees higher than the flow to the floor. The mean floor temperature was only 23°C (average of 28 & 18). If the mixing valve and pump were removed, the heat pump’s flow could go directly to the bottom manifold. To get the same floor heat output, the heat pump setting could be adjusted down so as to give a working flow of 26 and return of 20. 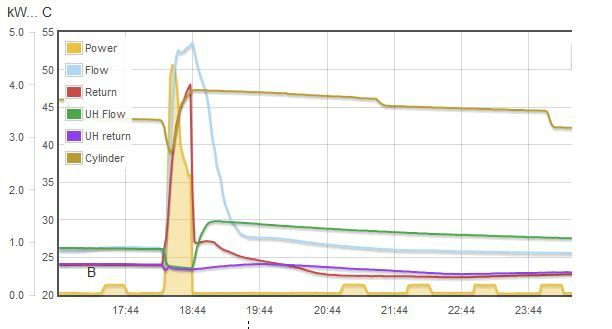 This is a reduction in flow temperature of 9 degrees, potentially (according to our first graph at top of page ) saving 13%. 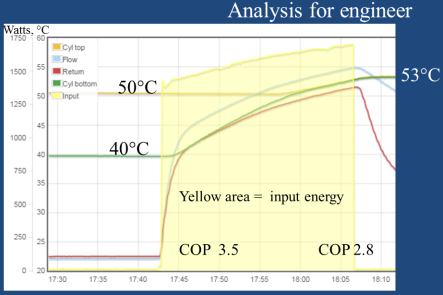 (see top graph – The COP at 35°C is 3.1, at 26C its 3.1, saving 13% in COP). All these little details can eat into potential savings. They should be dealt with at design stage. A college tutor recently suggested to me that the current environment in the heating industry does not encourage analytical thinking. Maybe I should therefore be less amazed when I come across plumbers who think copper and plastic pipe are interchangeable. Before you think I am anti-plastic pipe… I am not. The right size plastic is absolutely fine. Environmental considerations of the materal aside, a more direct issue is that of flow rate and pressure drops. Bore size of plastic is considerably smaller than copper, and it seems that this is often overlooked. 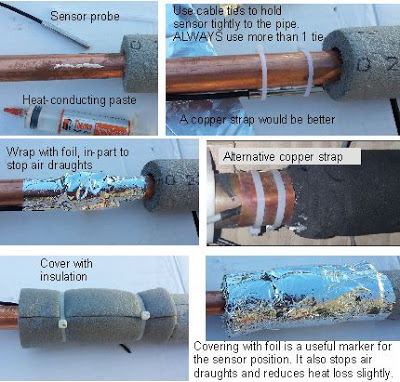 If installers select plastic pipe instead of copper without checking the size correctly, this could have a negative effect on heat pump’s performance. With respect to the materials of plastic and copper, it would appear that the total energy involved in mining and manufacturing copper is far greater than the total energy (including the crude oil to make the plastic) to manufacture plastic pipe. Here is one site that discusses the topic , though not necessarily without bias. Another factor to consider, that mainly affects pipe runs to hot taps etc, is the heat capacity of the pipe material. Plastic has a relatively high specific heat, and the wall is thicker, but it’s light. The net thermal capacity of the two is fairly similar. However, obvious factors aside, one of the biggest issues that could affect installations involving heat pumps relates to the internal bore diameter. This could have a very noticeable effect on the energy-efficiency of the system. All metric pipes are measured by their outside diameter. 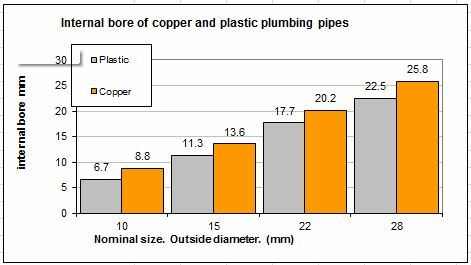 As can be seen, with common pipe sizes (outside diameters), equivalent plastic pipes have considerably smaller internal area to copper. This has a dramatic effect on flow characteristics. The graphs below illustrate examples of the relative internal dimensions of common pipes. A brief note about smoothness – It seems a common belief that plastic is ‘smoother’ than copper, but the inner wall ‘smoothess’ of the two is about the same. However, plastic can be one-piece with slow sweep bends. In a different sense of the word, this is certainly ‘smoother’ than copper with tight elbows. Re inner surface, we can assume the two materials are about the same. 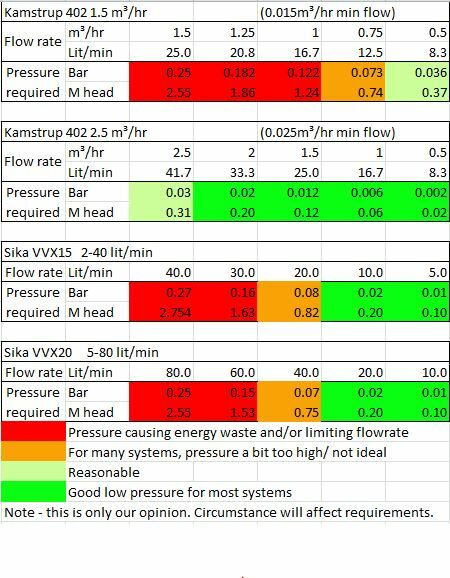 Whilst it is fairly easy to look-up the pressure drop resulting from a specific flow rate with a specific pipe, we can see from the 2nd graph at-a-glance the relative flow capacity since the cross sectional area loosely indicates flow capacity. If a certain flow rate is required, then we can look-up the required pressure that is required across the pipe length (beginning of pipe to end of pipe length). The internal bore must be chosen such that the circulation pump is not overly large and energy-wasteful. This graph shows the approximate pressure required to maintain a certain flow rate for one specific fixed length of pipe example. As can be seen, the pressure drop along the example pipe varies very dramatically, so the wall thickness makes very big difference. 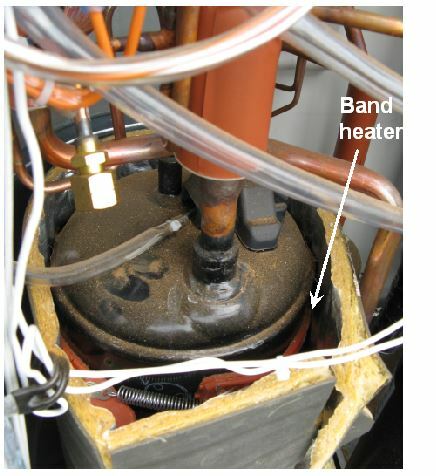 In this example, we can see that a 15mm copper pipe could be used with a common central heating pump (shown at 3.6m head, 36kPa). However, if plastic were chosen, then one would need almost 9m head to achieve the required flow – far beyond the capability of normal circulators. On the other hand, if 22mm plastic were chosen, the pressure requirements would be only 1m head (10kPa) which is likely to achieve very low circulation pump energy. In real life, we tend to have a pump connected to a pipe system, and the flow rate that results is dictate by the balance between the pressure produced by the pump and the ‘restriction’ of the entire pipe work circuit. There is a common concern about the restriction caused by the inserts (stiffeners) needed at joints. These restrict the bore, but they are so short that the the affect on flow is much less than it may seem. The above graphs show relative changes in flow rate that would result from a fixed pressure. If the pipe chosen were too small, then a larger circulation pump may be needed in an attempt to compensate for the extra restriction caused by the small internal bore. 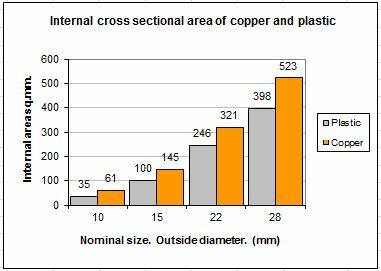 The point here is that by choosing plastic instead of copper of the same nominal size, the system could potentially suffer unless the sizing is checked. There is of course no problem using plastic if it’s the right diameter. Indeed, 28mm plastic may be an ideal choice for the connections from a heat pump simply to minimise noise transmission. The best final solution is often a mixture of both plastic and copper for a multitude of reasons. All this emphasises how dramatically the wall-thickness affects flow rates and pump pressure requirements, but how does this translate into reduced COPs? Let us consider a radiator at a far distance from the heat pump. The flow-rate relates to the pressure drop, which relates directly to the pipe-run length, and of course, the required flow-rate relates to the room size (bigger the heat demand, the more flow required). In this instance the room is large. 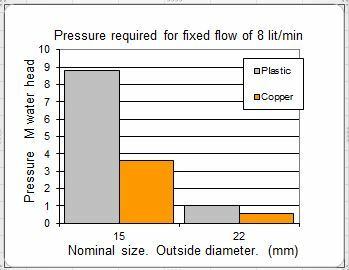 The default pipe size choice would be normal 15mm (outside diameter), but if the sums are done, it may become apparent that the choice should be between either 15mm copper or 22mm plastic. How could a pipe with too small bore affect the COP? Radiators should be balanced, in general by throttling valves (lockshield) on smaller radiators, and those with shorter pipe runs. However, this is actually quite a difficult thing to achieve with a heat pump because the temperature difference (water inlet to water outlet) may only be 5 degrees (°C). (It’s much easier to measure and adjust when the temperature differences are larger). It is not ideal, or easy, to have to throttle most other radiators on a system, and there is the added risk of the circulation pump not being big enough to cope. The likely result of any ‘restrictive’ pipe-runs would be a reduced flow rate to the radiator. This would result in a considerable area (the bottom) of the radiator being cool, and a reduced heat output to that room. The obvious action to redress the short-fall of heat would be to increase the flow temperature by increasing the heating curve setting of the heat pump. i.e. increasing the flow temperate from say 40 to 45°C. Now the heat pump has to heat ALL water to a 5 degrees higher level. This is likely to reduce the COP by 10 to 12%. This all indicates that one must never assume copper and plastic are interchangeable without considering the pressure drops and diameters. That aside, we have also highlighted the importance radiator balancing. Ideally the pipe runs to radiators would be laid out, and bore sizes chosen so that the flow rates are naturally about right without the need for much valve adjustment. A little extra work on the design makes life much easier thereafter. Here you can enter pipe sizes and find out the pressure requirements to achieve a certain flow rates. 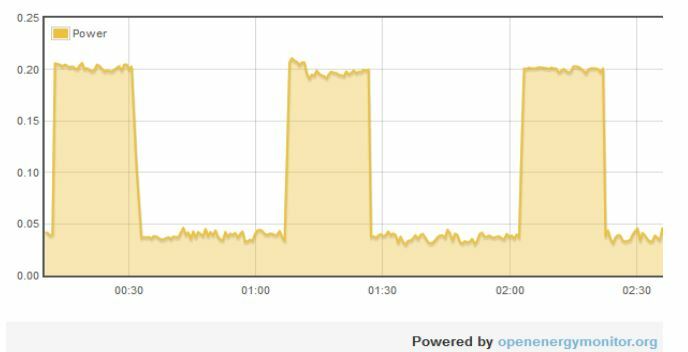 I have been aware for some time that my 5kW air-source heat pump (ASHP) has been using about 3/4 of a kWh/day whilst doing ‘nothing’ over the summer (no circulation pumps running), but recently I have put energy monitors on other ASHPs and was shocked see that these known-brand units are using 2kWh/day when doing no heating at all – I bet the average family use less than that showering! (an 8kW shower for 15 mins = 2kWh). Whilst in standby mode, is there any reason or excuse for it consuming so much? I think not. There has, in recent years, been a general focus on standby power since this ‘constantly dripping tap’ can tot-up to a sizeable amount. Highlighting this problem has been very productive – the standby power of most new products has now plummeted. Yes you have that right – my fridge, in use, used one quarter the power of the heat pump on standby! Here is a plot of the 9kW ASHP that is consuming 2 kWh per day (Y axis is in kW). It alternates between about 35-40 watts and 200 watts. Below is a plot that shows an 8 hr period.. Scale is 0 to 5kW input power. The buff-coloured area on this 8hr plot relates to energy use, and shows a hot-water cylinder heating ‘hump’ (above 18:44) . This illustrates at-a-glance that the buff-colour area of the standby ‘blips’ (on the bottom axis) forms a significant chunk of the total. I have previously decried ground source units with controllers that use 15 watts, so why are these particular air-source heat pumps using so much? The oil inside the compressor can absorb some of the refrigerant. This not only thins the oil, but it can cause oil-foaming at certain times – both can lead to bearing failure due to inadequate lubrication. One answer is to keep the oil warm, and a small electric compressor heater (crankcase heater) can be used for this purpose. Ground source units are situated indoors, so usually stay relatively warm. I don’t know of any GSHP with a compressor heater. However, air-source are sited outside, and they can experience extreme ‘swings’ of temperature. The worse scenario would be a cold sub-zero night followed by a warm day. In this scenario, the lightweight heat-exchangers warm up, but the heavy compressor can remain the coldest part of the system. Some refrigerant can then migrate to the coldest part (in effect, it condenses in the compressor like water condenses on cold windows). If this cold refrigerant-laden compressor were to start, then there is risk of damage. The picture shows the compressor with strap-around element heaters. The compressor was quite warm, but one wonders why the lagging around the shell was open at the top; possibly to aid compressor cooling for times when the compressor is working at it’s upper temperature limits? There is a lot of scope here. Most of these Japanese-type heat pumps are very impressive, they are clearly very well developed and very reliable. 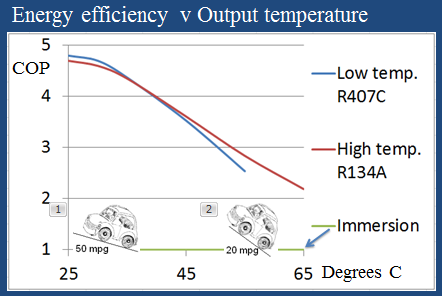 Computer-aided fan and heat-exchanger design has led to highly efficient quiet products, and most defrost mechanisms are very well optimised, but are all aspects up to scratch? It seems already (from graph) that the heater is pulsed, and not simply left on, so why cannot a little more intelligence be added to the controller so that the switching can be controlled more responsibly. Lagging the compressor should also be possible, and should help, but now one might need to introduce some form of cooling to deal with overheating whist running. There are many options here, and it would take time for a designer to work out the best reliable and cost-effective option that did not compromise over all energy use. I have certainly spent many hours in the past designing crankcase heaters out of systems. The phrase ‘could do better’ springs to mind, and this sentiment should really be directed to the manufacturer’s design office. A similar situation existed with washing machines many years ago. All for the sake of a thermostat, the hot water feed was blended with cold, just in case the hot feed happened to be at 70C , and could therefore potentially damage clothing. No manufacturer wanted to be blamed for harming any clothes so they all played-safe and kept it simple, to the detriment of energy-efficiency. My feeling is that we are at the same point with some aspects of ASHPs. Whilst standby power is a small fraction of the total annual consumption, it is still a detail worthy of attention since I’m sure it could easily be improved significantly. I can think of a simple solution. Make it mandatory to print the standby power on the product label. This would push the manufacturers to give it a little more attention, and sooner or later this unnecessary waste would disappear.